Unlike their more ferocious cousins, the smaller pygmy hippo tends to run when threatened and is endangered today. According to the IUCN, most Pygmy Hippos today live in Liberia. Troublingly, they are an "Endangered Species" whose numbers continue to decline further still. The pygmy hippopotamus is a smaller version of the more well-known common hippopotamus, both belonging to the Family Hippopotamidae. It possesses a barrel-shaped body, and its skin color is either black-brown or grayish purple. The pygmy hippo has a broad snout, and short stocky legs. Its toes are separated, and have sharp nails, and its incisors and canines look like tusks. When mature, a pygmy hippo's height at the shoulders will be between 31.5 and 39.4 inches (80-100 centimeters), and its weight between 353 and 595 pounds (160-270 kilograms). Its body length from head to rump is between 59.1 and 68.9 inches (150-175 centimeters), and it has an eight-inch (20 cm) tail. A pygmy hippo is herbivorous. Its diet is comprised by a variety of herbs, broad-leaved plants, grasses, semi-aquatic plants, forbs, tubers, roots, sedges, ferns, and fallen fruits. The pygmy hippo begins to feed in the late afternoon and does so until midnight by grazing around the forest. It may stand on its hind legs to reach high vegetation. The pygmy hippo's lips are dexterous, and can grasp fruits without using their teeth. Though it eats a variety of aquatic plants, they prefer food on the land. Though it has a multi-chambered stomach akin to that of a ruminant, it does not chew its own cuds. The pygmy hippo is native to West Africa. Namely, it lives in countries such as Liberia and, to a lesser extent, Sierra Leone, Guinea, and Cote d'Ivoire. Rainforests, swamps, and thickets near waters and streams are where the pygmy hippo is usually found. However, it is less aquatic than the common hippo, and spends more of its time on land. According to the International Union for Conservation of Nature (IUCN) Red List report, the Pygmy Hippo is classified as "Endangered" species, with an estimated 2,000 to 3,000 left in the wild. The Zoological Society of London report attributes their decline in numbers primarily to poaching and habitat losses resulting from human logging, mining and agricultural activities. The pygmy hippo is solitary in nature, except when breeding or raising young ones. It is shy and does not defend its territory, instead typically running when confronted. On occasion, they will huddle in small family groups. A female pygmy hippo has a home range of about 100 to 150 acres, while a male has one of around 400 acres in size. These animals move along pathways used by other hippos, and they mark these routes with their dung. 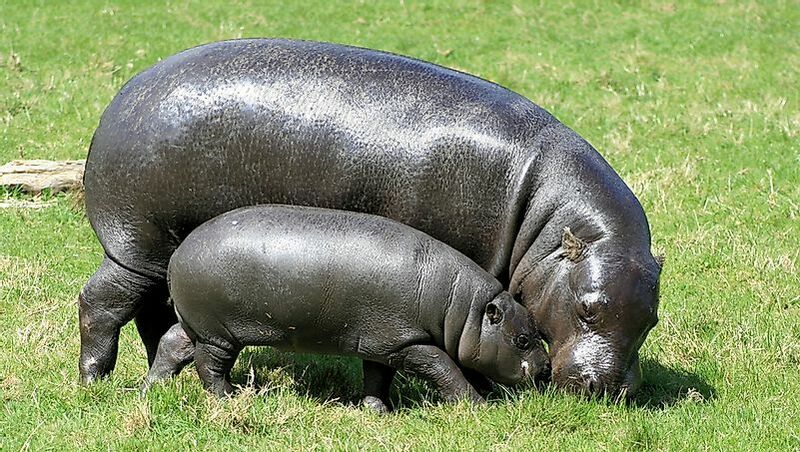 When eating, the pygmy hippo munches on vegetation, and can be heard up to 150 feet away when doing so. Leopards are the main natural predators of pygmy hippos. A pygmy hippo reaches sexual maturity between around 3 and 5 years of age. To reproduce, the male pygmy hippo seeks out a sexually mature female, and they form a partnership. The pair mates on either land or water, and may copulate for up to 4 times when a female is "in heat". Their gestation period lasts from 180 to 210 days, and the female gives birth on land to a single calf. This calf weighs between roughly 10 and 14 pounds (4.5-6.5 kilograms), and when growing can gain from 10.6 to 21.2 ounces (300-600 grams) daily. The expected lifespan of a pygmy hippo is between 30 and 50 years.